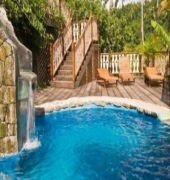 Fond Doux Holiday Plantation in St Lucia is a 19th century colonial plantation hotel set in nature amidst the lush, tropical foliage of St Lucias breadbasket, historical centre and world heritage site, Soufriere. 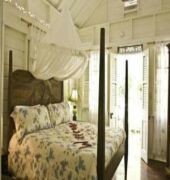 Soufriere, home to St Lucias majestic Pitons, a world heritage site, forms the backdrop to this rustic, ecological plantation hotel which effortlessly marries old world colonial with every modern amenity in natures richest surroundings. Imbued with a magical ambience, Fond Doux Plantation estate in St Lucia is ensconced in verdant tropical gardens, and surrounded by one of Soufrieres most active agricultural plantations. 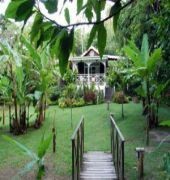 The French colonial estate house overlooks lush green gardens and original colonial cocoa racks and is minutes away from one of natures wonders, the Pitons world heritage site. 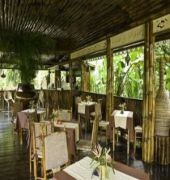 Luxurious, historical and architecturally intriguing the Fond Doux Holiday Plantation is a journey back in time and closer to nature.